In the Summer 2013 issue of Interweave Crochet, you’ll find a nifty pattern for crocheted sleeves by Natasha Robarge. 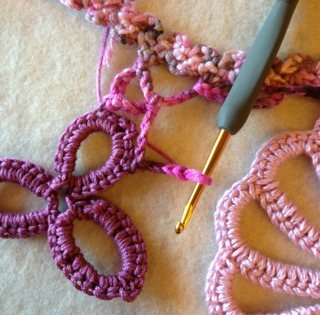 This little tutorial should help you create, assemble and join the motifs. Joined, the motifs form cap sleeves that replace fabric sleeves on a jersey shirt. 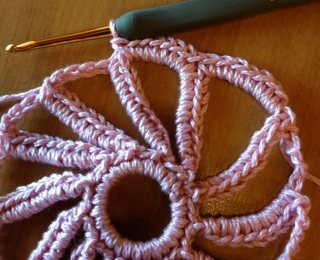 Each sleeve calls for a large flower, a half flower, and three leaf pieces: a one-leaf piece, a two-leaf piece, and a three-leaf piece. In addition, you’ll work a very charming rick-rack-type edging that is super addictive. 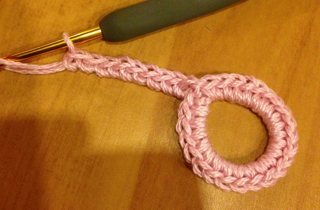 This goes around the sleeve cap and the sleeve edge.Note that when you initially work the edging it will be all twisty, like a corkscrew. Just hold a steam iron over the edging and give it a little blast. It will straighten out right away. In fact, you’ll want to steam all the pieces before you join them. The flower motif has an interesting construction that may give you pause for a moment. Here’s a walk-through. Make the chain as described, leaving a pretty long tail as instructed. 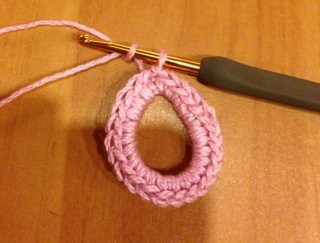 Work over this tail as you crochet around the circle. 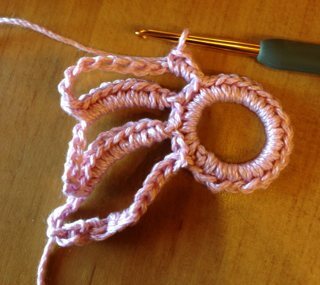 Now, here’s the part you may not have done before: Crochet around the tail as instructed. Then chain as instructed. Right there in midair without joining first (no picture of this–sorry). 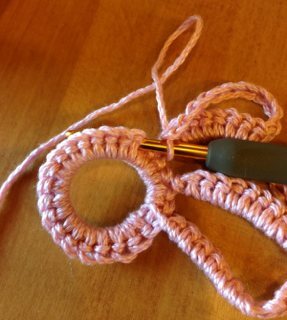 THEN you TURN the work and slip stitch into the backside of the circle. (Pay attention to the TURNS in the pattern. I missed a turn in my first bloom, shown in the top photo.) 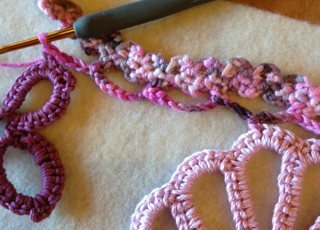 TURN, and then crochet up the chain you just made. There will be naked chains at the top when you’re done with the stitches. This is OK. 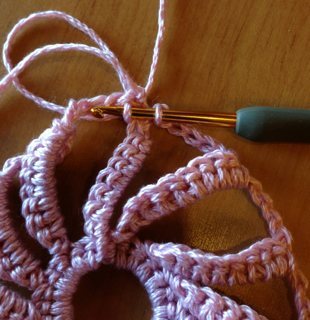 When you work all your blooms, chain as instructed, then join with a slipstitch in the first bloom. 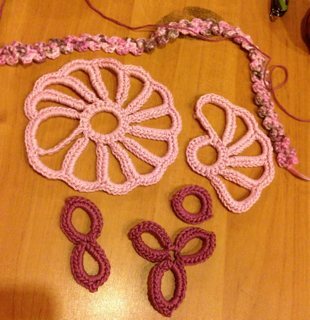 TURN, and then crochet over those naked chains as instructed. TaDa! 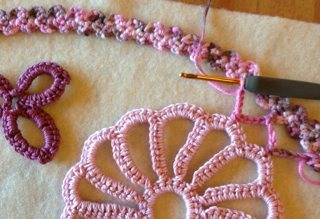 When your blooms are done, lay out your pieces on the sleeve template as described in the pattern. 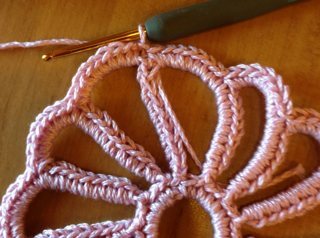 NOTE: I have worked my pieces in a heavier weight cotton because my wrist is unhappy and I am unable to crochet thread at the moment. Therefore, I did not do a sleeve template because I don’t have a sleeve large enough. So, if the pieces look big to you in relationship to the size of the hook, that’s because they are. 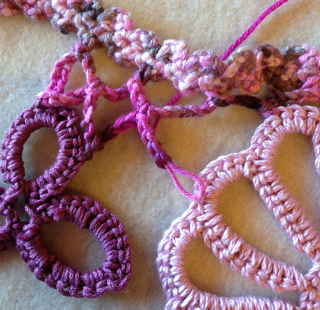 And we’ll just carry on with the whole joining thing as if these are lovely wee bits of cotton thread. 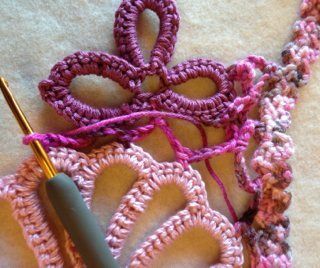 After you have laid out your motifs as desired on the template, turn them wrong side up, with spaces between. 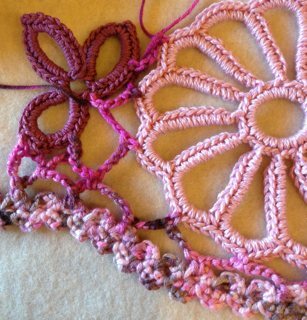 The pattern allows for using the very long tail of the motifs as a joining thread. I have used a separate joining thread. I started at the edging. 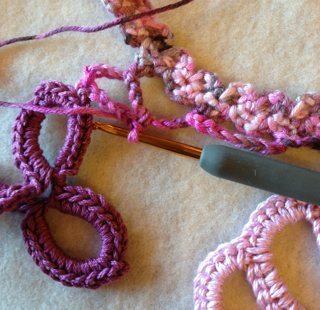 Working in a zig-zag pattern, work 3-4 chains, and then join to the motif with a sl st, inserting hook back to front; work 3-4 ch, then join with sc to edging, repeat until you come to a place where you would need more than 3-4 ch to join. At this place, chain twice as many ch and join a little ways down the edging (skipping 1 rick on the rick-rack is about right). Repeat this until you get to a place where you can join to the next motif with just 3-4 ch. Sc in new motif, ch 3-4, then work sc in larger ch space. Then work 3-4 ch and join to same motif. Ch 3-4 and join with sc in the next big loop. At this point, you are close enough to the first motif that you can ch 3-4 and join to first motif. Continue on in this way, joining motifs and filling space as necessary. This is an inexact thing—let your eye be your guide. Note the thread awkwardly caught in the space between some chain loops because SOMEbody didn’t remember to pull it round to the working side. Don’t let this happen to you. This is it, flipped over, right side up. It looks a little disheveled, but a blast of steam and a bit of pinning will straighten it right up. You can apply these motifs in other ways as well — use them to fill a scoop-neck tee or dress. Or use them as an insert in the back of a tee. Try them to add a flirty hem to a dress or skirt. Let us know how you use this technique to create your own designs!